We are very excited to announce our Stockyards District Residences development with developer partner Marlin Spring was just celebrated its Grand Opening on February 9th! 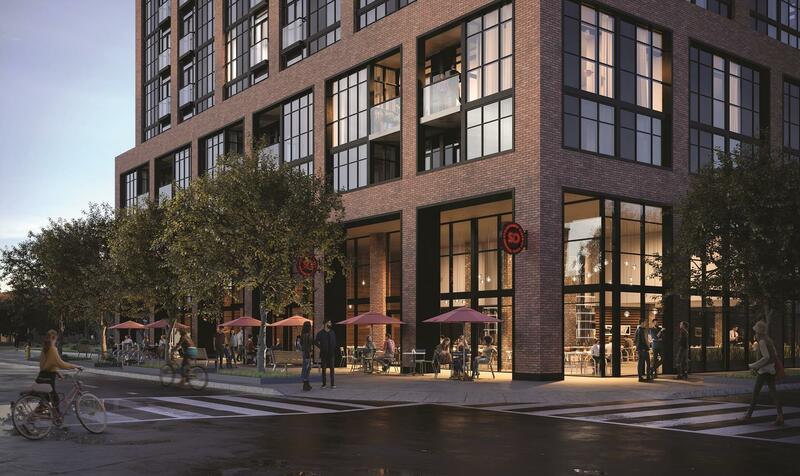 Located at 2306 St. Clair Avenue West, the mixed-use, Graziani + Corazza Architects-designed 10-storey development has taken inspiration from 20th century industrial architecture; fitted with black-framed sizeable windows, offering future residences ample natural light, the structure is complemented by a red brick exterior with a green roof and landscape design by NAK Design Strategies. The rustic aesthetic boasts modern efficiencies while still complementing the surrounding area, which was once the site for various industrial spaces and facilities. The development is within walking distance to an abundance of local amenities, including various boutiques, shops, and cafes. Additionally, the site is conveniently accessible to public transit as well as scenic bike paths, with a craft brewery and urban center adding ample options for exploration! The Stockyards District has been revived but the spirit of the past remains – transitioning and growing into more of a social community, while keeping the roots of its architecture and history alive. We encourage you to visit the updated Stockyards District Residences website to learn more about this exciting development.